Last update: October 13, 2007. The permanent address of this page is: http://pobox.com/~JasonHarper/Nixie.html Please use this address if you bookmark or link to this page, rather than the redirected address that appears in your browser. 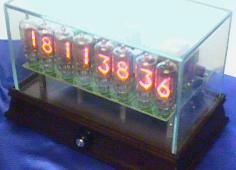 Nixie tubes (see above) were a common form of numeric display for electronic equipment from the mid-1950's thru the early 1970's, when they were supplanted by 7-segment LED displays. The basic principles behind Nixie tubes live on in applications both low tech (neon light bulbs, as are used in nightlights) and high tech (plasma display panels), but Nixies themselves have long been considered obsolete. While LEDs (and later LCD displays) are certainly superior from a technical standpoint, their aesthetics leave something to be desired. We've become used to numbers formed entirely from straight line segments, looking only vaguely like written or printed numerals. A Nixie's digits, on the other hand, are individually formed, and can easily incorporate arbitrary curves and sloped lines. The only real flaw in a Nixie display is due to the fact that the digits are stacked in front of each other, and therefore all but the frontmost digit will exhibit tiny gaps where they are shadowed by the digits in front of it. 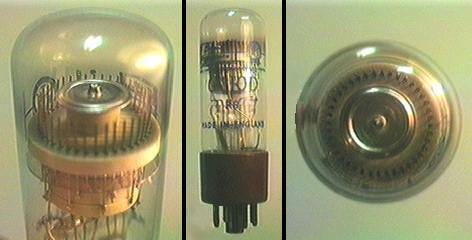 Dekatron tubes (see below) are an even earlier technology (late 1940's thru early 1960's), based on the same principles as Nixies. Their display capabilities are rudimentary, consisting of a simple dot of light that moves along a circular path visible through the end of the tube - labels placed around the tube are required to associate a numeric value with the position of the dot. However, the Dekatron's claim to fame is that it is more than just a display device: it is capable of maintaining the displayed value, and incrementing or decrementing it, with a minimum of external components. Any other technology of the day with such capabilities would either be mechanical (and thus rather limited in its maximum change rate), or require at least four vacuum tubes and a pile of other components to drive it. 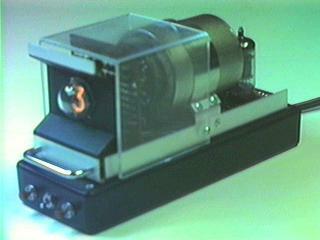 Dekatrons were used for high-speed counting, and as computational elements in early digital computers. I am working on a series of unique digital clocks, based on Nixies, Dekatrons, and other unusual display technologies. While I'm hardly the first person to build a Nixie Clock (indeed, that's long been the traditional thing for an electronics hobbyist to do with Nixie tubes), I seem to have been the first to build a Dekatron Clock in recent times - the only other ones I've found references to are more recent projects than my original one. I'd appreciate any information anyone can supply about older Dekatron Clocks. 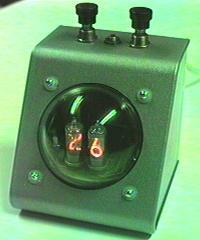 World Power Systems (Tom Jennings) has some info on Nixie, Dekatron, and similar tubes. WPS also makes a line of Nixie Clocks and other faux-antique electronic devices, built with far more attention to detail than I'm capable of. They're presented as works of fine art, and are priced accordingly. Mike Harrison also has info on these kinds of tubes, and many other kinds as well. He also has plans for building your own Nixie Clock, although with less functionality than the ones I'm working on. Cosmodog has Nixie Clocks available for sale! They still don't have an enclosure designed, but you can buy the bare electronics and find a case of your own. 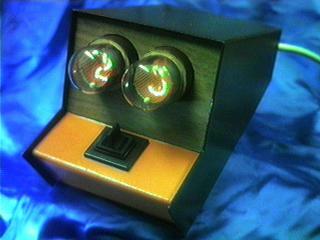 There are some very good close-up shots of Nixie tubes in operation at this site. David Forbes sells a clock using a small CRT for its display. Prices range from $95 for a basic kit (no case or CRT) to $250 for a complete assembled unit. Jeff Thomas sells a limited edition Nixie Clock, and even a Nixie Wristwatch! Please note that I am not in any way associated with the sites above. That may seem a rather strange disclaimer to have to make, but there has been some confusion on this point in the past. NixieTransistors (PDF, 55K, v1.0) - a tutorial on using discrete transistors in Nixie driver circuitry. I sell my clocks via eBay auctions (my eBay user ID is 'jasonharper'), and I also custom-build them. If you'd like to be informed whenever one of these items becomes available, please click here to be added to my mailing list. The last update (Nixie-Times #10) was sent on September 1, 2004; if you subscribed prior to that date, and haven't received anything, please contact me to get things straightened out. There are currently at least a dozen subscribers whose addresses are bouncing. Please note that these items will be sold for use in the USA and Canada only: they WILL NOT work with the different power line voltages and frequencies used in other parts of the world. I could guess at the changes needed to make them work elsewhere, but since I wouldn't be able to actually test them, I wouldn't feel comfortable selling a clock under those conditions. Status: Picked up by the buyer on October 3, 2007. Another commissioned clock, the first one I've done that incorporated an analog meter. Status: Delivered to the buyer... a long time ago, I didn't get around to updating this page for a long time, and no longer remember just when it was finished. 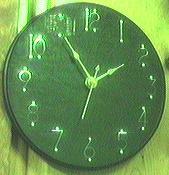 This clock was a commissioned work. Status: Sold at eBay auction for $9.99, on September 7, 2004. "What do you do with a broken Nixie, what do you do with a broken Nixie..." My answer, after receiving a batch of tubes that didn't all survive despite apparently sufficient packaging, is to use the digit electrodes as numerals for a 6" diameter analog clock. Three broken tubes do not supply enough "1"s for a complete face, so I used a flattened-out anode mesh from one of the tubes in place of the "11". Click for a larger picture, or a side/back picture. Status: Sold at eBay auction for $77, on September 7, 2004. 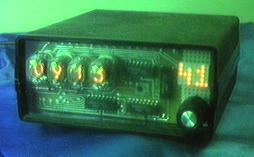 This is clock #5 of my type 1b design, built in a rather different enclosure. Status: Sold at eBay auction for $130.27, on September 7, 2004. I don't have a page created for this clock yet, look at the auction description for now. Status: This was a commissioned work, delivered to the buyer in June, 2004. More details here. Now that I have a tested design, I could easily make more 8-tube clocks like this one (probably in a different case style) if anyone wants them. I will probably make these by request only: the parts cost is simply too high to risk building them without a guaranteed sale. Status: Failed to sell via eBay auction. Was sold in a private transaction in April 2004. 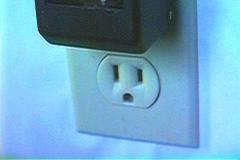 Status: Sold at eBay auction for $49.99, on November 3, 2003. Yet another type 2a clock, in yet another case style. Russian IN-1 Nixies this time. Status: These can be built to order for $75. #7 - sold in early 2007. #6 - sold in private transaction, August 2004. #5 - built in different enclosure: see the Lighthouse Clock above. #4 - sold at eBay auction for $53.03, on November 3, 2003. #3 - sold at eBay auction for $49.99, on October 19, 2003. #2 - sold at eBay auction for $53.09, on October 10, 2003. #1 - sold at eBay auction for $89.88, on September 30, 2003. 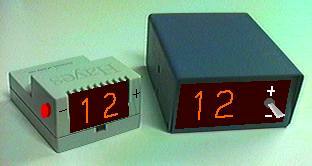 I've finally gotten around to mass-producing a version of my 1-tube, AC adapter clock design. Click here for more details. They haven't been selling quite as well on eBay as I'd hoped, so for now they're going to be built to order - $75 (including shipping), with completion taking anywhere from a day to a month depending on what parts I need to order. However, when building one, it's little more effort to build another one or two, and I may still offer those extras on eBay. I may also list versions in different enclosures (such as the lighthouse clock) on eBay, as a way of gauging interest in them. Status: Sold at eBay auction for $246.50, on August 12, 2003. Status: This was a commissioned work, delivered to the buyer in April 2003. 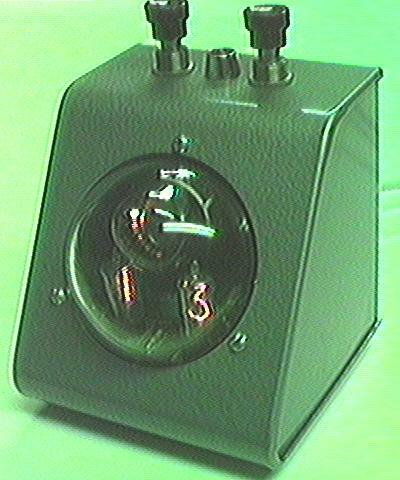 This is basically the same as my type 2a clocks shown below, with a Dekatron tube added. I recently picked up this nifty old Rensie desk clock on eBay. 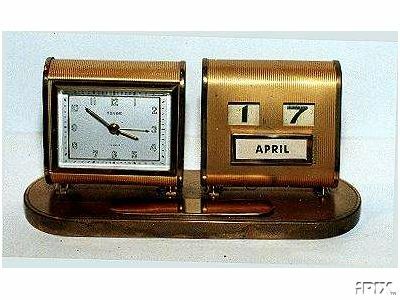 The left side is a wind-up alarm clock, the right is a calendar that is manually advanced by tilting that side to the back. Unfortunately, both the clock and calendar mechanisms are broken, or perhaps that's fortunate, as I intend to make something even niftier out of it. Current plans: Two Nixies in the left side. 8-character alphanumeric LED display (an orange color fairly close to the Nixies) in the right where the month indicator was: this can either display separate information, or labels as to what the Nixies are currently displaying. Setting switches in the holes where the date was shown. The tilt feature of the right side will be kept, and used as the snooze button for the alarm. More details to follow as I get further along with this project. Status: Sold at eBay auction for $109.50, on August 11, 2002. This is basically the same as my type 2a #1 clock shown below, just in a different case style. Status: Sold at eBay auction for $154.01, on June 2, 2002. Had to be returned for service due to a minor design flaw. This clock is based on a vintage Burroughs Beam-X decimal counting module, although it really only counts as a Nixie clock (functionally identical to my type 1a #1 clock) - the Beam-X tube isn't actually used. Status: Sold at eBay auction for $135.59, on June 2, 2002. I've finally gotten around to building one of my earliest Nixie clock ideas, which came about when I noticed that a clear plastic dome (which I'd bought for an entirely different project) happened to exactly match the diameter of the opening in a Bud sloped-front meter case (which was an unexpected part of a lot of electronic items I got on eBay). 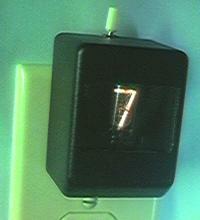 This clock uses electroluminescent panels, which are most commonly seen as a form of backlighting for LCD displays. EL lighting is also used in lower tech products - the six display elements here are standard DeltaLite nightlights, held in place by a large thumbscrew. While there has been some commercial development of dot-matrix EL displays, I'm not aware of any commercial use of them in a segmented display (I am aware of a home-built clock using rectangular EL elements in a standard 7-segment layout). Almost certainly nobody has ever used them (or anything else) in this 6-segment hexagonal format: it should be easy enough to learn to read it, but nobody is going to immediately recognize this device as being a clock, or any other form of numeric display. One interesting property of EL panels, not used in their typical applications, is that they vary somewhat in color based on the frequency applied - from blue to bluish-green for the ones I'm using. My plan is to alternate between the two colors for each digit, so that times with repeated digits (like 11:12:22) can be easily read without needing gaps between the digits. The case is from a Cayman GatorBox CS network router, which I consider to be the niftiest enclosure ever made that consists solely of right angles. It measures about 11" square from the front (which was originally the left side), and is 1.5" thick (4.5" for the bulge at the bottom, which contains the power supply). Thanks to Andrew Plotkin for the original inspiration to play around with EL nightlights. Status: March 22, 2002. Some mechanical work done, and a preliminary design for the electronics to drive the EL panels (which may or may not actually work - don't hold your breath waiting on this clock). No circuitry has actually been built yet: the "4" in the picture is hard-wired using a bunch of clip leads. This clock is a converted piece of 1965 electronic equipment. More details here. Status: Sold at eBay auction for $177.50, on March 18, 2002. Status: Sold via eBay auction for $121.59 on April 22, 2002. 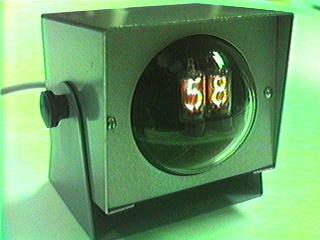 Enough interest was shown in this clock that I'm almost certainly going to build more of them. Status: Sold at auction on eBay for $104.59, on August 28, 2001. Status: It took over 4 years, but I finally finished the first clock I started! I was contacted by a person who had seen the movie linked below, and wanted to commission a Dekatron display piece just like it. Well, I was able to do better than that - having a guaranteed sale was quite sufficient incentive for me to finish up all the little incomplete details. 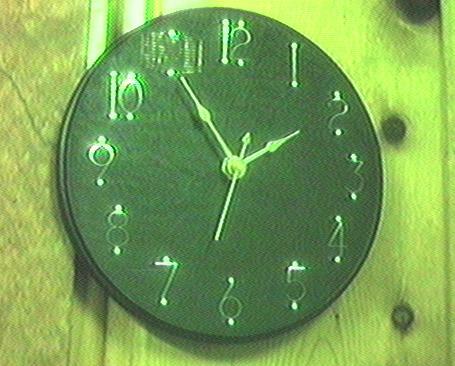 The clock was shipped to the buyer in June, 2004. 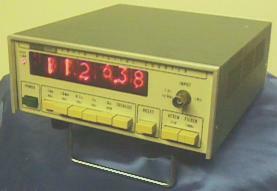 This 4-tube Dekatron clock is roughly 5" wide, 6" high, and 8" deep, actually composed of two identical 5 x 6 x 4 metal cabinets connected in the middle. The tube sockets are mounted on a metal plate separating the two cabinets, and the tubes extend for the full depth of the front cabinet (which is otherwise mostly empty). The back cabinet contains the rest of the electronics. The front is covered by a clear piece of plastic, engraved with numeric labels for the tubes on its inside surface, and edge-lit so that the labels are readable in the dark. The top tube is labelled 1 thru 12, and will display the hour or the month. The left tube (0-5) will be the tens, and the right tube (0-9) will be the ones, of either the minute or day of month. The bottom tube (unlabelled) will be seconds, with several display options available: spin around at various rates, swing back and forth like a pendulum, etc. 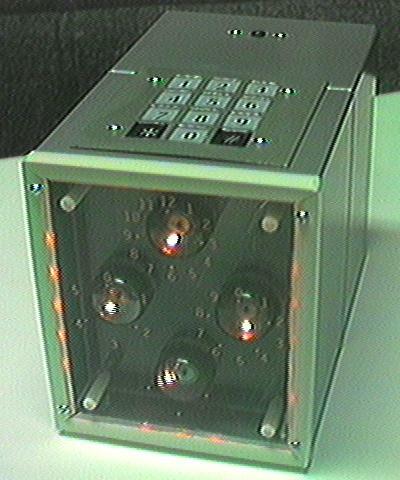 A numeric keypad on the top is used to set the time, date, and clock options. 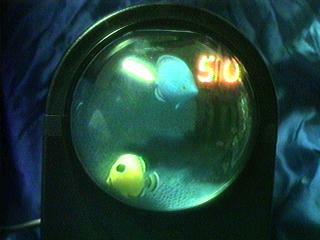 There is a demo mode, that simply spins or swings the tube displays around, with user-entered or random parameters. 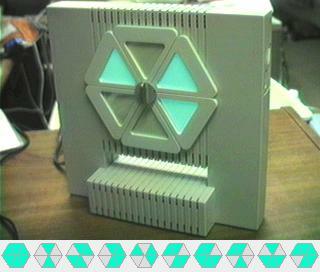 A 2-second looping QuickTime movie (519K) of the clock in operation (running a test pattern) is available. Interior pictures, technical info, and the instruction sheets are also available. Here are some of the clock ideas I'm considering (rather out-of-date at the moment). 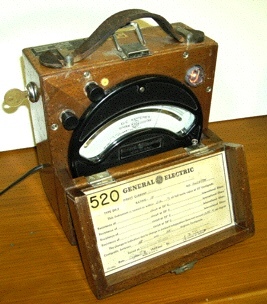 Shown here is an Industrial Electronic Engineers, Inc. rear projection incandescent display unit. I have four of these, so a clock is pretty much inevitable. These consist of twelve light bulbs, a sheet of transparent masks, and lenses that focus each masked bulb onto the screen in front. 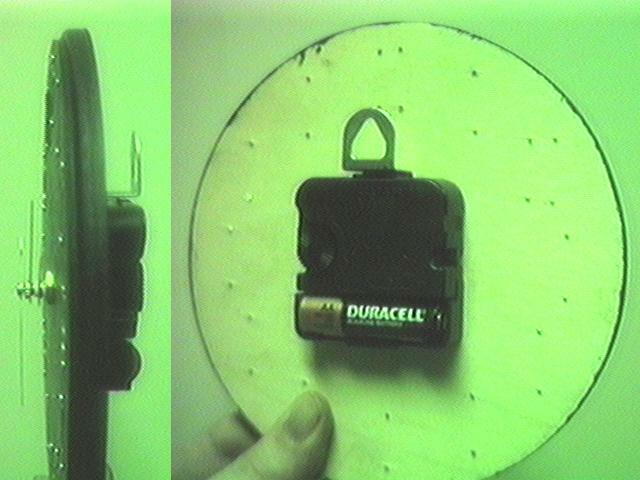 These particular units can display digits 0 thru 9, a red circle, or a green circle. The circles can be lit up at the same time as a digit, as shown here. I don't know what the intended use of the circles was, but they do introduce some interesting possibilities. For example, when setting the clock, I intend to use a red circle to hilight the digit that is currently being set. Of all the antique display technologies I've played with, this is perhaps the highest quality one - perfectly formed symbols, in multiple colors if needed, without the gaps and varying depths of Nixie digits. The one fatal flaw with this technology is the huge amount of space it takes up - these units extend almost 6 inches behind the panel. Update: I've picked up an additional unit, also made by IEE but labelled as a "One-Plane Readout" rather than an "In-Line Readout". On these, the two special symbols are small dots to the left and right of the digits, presumably intended as decimal points, but vertically centered - I suspect that decimal points in the normal location would be visibly out-of-focus. Unfortunately, this unit contains only three digits, sharing a common projection screen so it isn't practical to split them up or add another digit. Three digits isn't the most convenient quantity for a clock, but I have some ideas on how the time could be usefully (but obscurely) displayed in this format. It's likely that I'll make something with this unit first, if only because I have a nice metal cabinet that's just the right size for it. I've built two clocks of this general design now (Nixie type 2a #1, and Nixie/Dekatron type 21a #1). I still have one of these meter cases available, but unfortunately my source of the plastic domes that exactly fit them has run out. I picked up two of these 8.5" wide, 7" tall, 7" deep meter cases at an auction. The picture doesn't show this very well, but they're NOT just a rectangular brick - the front slopes back about 10° from vertical, and the top slopes down about 10° from horizontal. Also, they're a lot brighter orange than the picture shows - all in all, they're quite eye-catching. 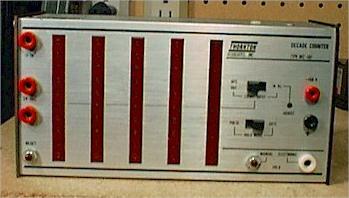 I have several old TK-50 tape drives, which are almost completely worthless. They store a measly 95 MB of data on tapes that are no longer available, and don't work on any current systems anyway due to a hopelessly non-standard SCSI implementation - I have no objections at all to gutting them and installing some more interesting (if arguably even more obsolete) electronics. So, imagine a Nixie Clock inside your computer - mounted in a standard 5.25" full-height drive bay. The main problem would be in powering the clock - my standard design is based on a direct connection to the power line, and use of the 60 Hz power line frequency (which has very good long-term accuracy) as the time reference. The easiest solution would be to run a separate power cord to the clock, threaded through the back of the computer somehow, rather than trying to power the clock from the drive bay's power connector. This would also allow the clock to continue its display and alarm features even while the computer itself is shut off. I have a variety of more or less ordinary electronics project cases, and can of course find more like them fairly easily. I may use some of the larger ones for any future Dekatron Clocks, as the bulk of the tubes makes finding a suitable enclosure harder. However, I probably won't make any Nixie Clocks in cases like this, unless the demand for them turns out to be greater than my ability to find more interesting enclosures for them. When I first aquired some Nixie tubes, before I had the equipment and experience needed to make clocks with them, I built several of these nightlights that simply display a fixed (or manually changeable) number. I would still be willing to make more of these on request, but in general I'd prefer to apply my efforts (and limited supply of tubes) towards clocks and other, more advanced devices. Apart from being more useful, a clock would also last longer: the lifespan of a Nixie tube seems to be about 5 times longer if it is displaying a changing value, even one that changes as infrequently as every 100 hours. LEFT: Nightlight with on/off switch and light sensor (which didn't work very well). RIGHT: Nixie unit with DIP switches to select the digit to display. Custom-made for someone who will be using it as part of some sort of art project - I hope to have pictures or a link here when it's finished.